Happy NEW YEAR everyone! WOW January has been a real whirlwind! As most of you know, the first week of this month we moved the studio to a new location. As mentioned in your newsletter, the new location will offer more flexibility for the studio hours and you won't have to deal with the traffic of Central Avenue! It's been a busy month getting settled in and starting the new year. Feel free to stop by and see the new location any time you're in the neighborhood. For those that don't know, the studio is now located at 918 A Airport Road in Hot Springs. 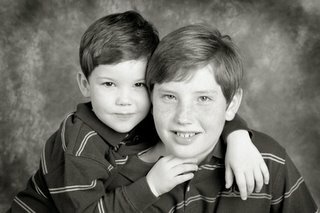 I'm going to share images from 2 sessions this month, first are 2 brothers, they were so much fun to work with! Their mother is an absolute jewel and having worked with other members of this family before, I was thrilled to have these boys come in! I could see that these two really love each other, (Big Brother) was so patient as we allowed (little brother) to crawl all over him, never complaining, we got some fun shots, some serious ones and some hilarious ones too! They're such basketball buffs, we even played with the ball! This is Canon, and he's been coming to see me his whole life, one big year! Happy Birthday Canon, this session if you can believe it, Canon wasn't feeling well, you can't tell it by his pictures can you? He'd been sick and as you can see, he was still full of laughter and happiness. He also got to play in his cake and got good and messy, just what Mommy and Grandma wanted. Ah this is why I love my job so much! Canon is just one of many I have seen as a tiny baby, turn into a toddler, and before we know it, he'll be trotting off to school with the rest of them! Are you on the newsletter email list? If not, email me to be added so that you don't miss out on important updates! Capture Life: Shelby Lane Portraits Studio Blog. Austin, San Antonio & New Braunfels Texas maternity, newborn, baby, child, family and high school senior photographer.